Back in 1999, when the New Mexico Legislature adopted "The Land of Enchantment" as the official state nickname of New Mexico, a technical error in the processing of the legislation prevented it from being properly entered into the New Mexico Statutes. In House Bill 430 and House Bill 13, mentioned below, the reference to the official state nickname of New Mexico is to correct this technical error made in 1999. Initial promotion of an official state amphibian and state reptile was sponsored by the New Mexico Herpetological Society. At public events sponsored by the society, surveys were conducted enabling visitors to the events to express their preferences for an official amphibian and an official reptile to serve as symbols for New Mexico. The results of these surveys ranked the New Mexico Spadefoot Toad (Spea multiplicata) and the New Mexico Whiptail Lizard (Cnemidophorus neomexicanus) as favored candidates for New Mexico's official state amphibian and official state reptile. As it turned out, another bill, House Bill 13, had been introduced in January by Representative Gail C. Beam. This bill proposed adoption of the Sandia Hairstreak Butterfly as the official state butterfly of New Mexico and, like House Bill 430, remedied the problem with the official state nickname of New Mexico. Because both bills addressed the problem with the state nickname, passage of each would cause additional technical problems within the statutes. To resolve the issue, the House Energy and Natural Resources Committee amended House Bill 430 to include the Sandia Hairstreak Butterfly in the legislation. In the Senate, the Conservation Committee recommended amending House Bill 13 to include the proposals for an official state reptile and an official state amphibian as well as an official state butterfly and the remedy for the issue regarding the official state nickname. Eventually, House Bill No. 430 was dropped and House Bill No. 13 moved on to be adopted by the New Mexico House of Representatives and the Senate. House Bill No. 13, adopting the New Mexico Spadefoot Toad as the official state amphibian, the New Mexico Whiptail Lizard as the official state reptile and the Sandia Hairstreak Butterfly as the official state butterfly was approved by the New Mexico House of Representatives on February 5, 2003. It was approved by the Senate on March 19, 2003. The bill was signed by Governor Richardson on April 6, 2003. This bill also placed "The Land of Enchantment" in the statutes as the official state nickname of New Mexico. Photograph: © James Brennan. Used with permission. 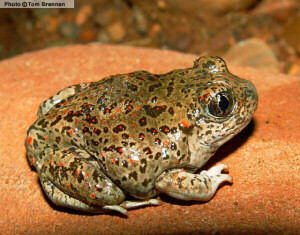 The New Mexico Spadefoot Toad is sometimes referred to as the Mexican Spadefoot Toad or the Western Spadefoot Toad. The largest males grow to be about 2 1/2 inches long. They are brown, grayish-green, or dark gray with small spots or sometimes blotches on their backs. Some may have light stripes on their backs and sides. Red-tipped knobs or lumps, called tubercles, are scattered over their backs and heads. New Mexico Spadefoot Toads have large eyes like other spadefoots. They have short horny spurs on the bottom of each hind foot which are used to bury themselves in the ground where they remain for months at a time emerging to breed in temporary rain pools created at the onset of the summer monsoon season. The sound made by Spadefoots sounds like a fingernail running along the teeth of a comb. Some say they give off an odor of peanuts when they are handled. New Mexico Spadefoots are carnivores and they eat a variety of invertebrate prey. Termites, ants, beetles and spiders provide the bulk of their sustenance. The following information was excerpted from the New Mexico Statutes , Chapter 12, Section 12.3.4. CHAPTER 12. Miscellaneous Public Affairs Matters. ARTICLE 3. State Seal, Song and Symbols, 12-3-1 through 12-3-17. SECTION 12.3.4. State flower; state bird; state tree; state fish; etc. 12-3-4. State flower; state bird; state tree; state fish; state animal; state vegetables; state gem; state grass; state fossil; state cookie; state insect; state question; state nickname; state butterfly; state reptile; state amphibian. M. "The Land of Enchantment" is adopted as the official nickname of New Mexico. N. The Sandia hairstreak is adopted as the official butterfly of New Mexico. O. The New Mexico whiptail lizard, scientifically known as Cnemidophorus neomexicanus, is adopted as the official reptile of New Mexico. 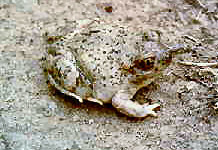 P. The New Mexico spadefoot toad, scientifically known as Spea multiplicata, is adopted as the official amphibian of New Mexico. Chasey, Gail. The State of New Mexico. New Mexico Legislature. House Bill No. 13. Santa Fe: The State of New Mexico, 2003. Web. Boykin, William "Ed". The State of New Mexico. New Mexico Legislature. House Bill No.430. Santa Fe: The State of New Mexico, 2003. Web. State Amphibian: New Mexico Secretary of State: State Symbols. Spea multiplicata Mexican Spadefoot, New Mexico Spadefoot: University of Califorina, Berkley: AmphibiaWeb. Spea multiplicata, Mexican Spadefoot: Great close-up photographs from J.D. at the University of Georgia. Spea multiplicata New Mexico Spadefoot: The Encyclopedia of Life. Spea multiplicata (Cope, 1863), New Mexico Spadefoot: A network connecting science with conservation - NatureServe Explorer: An Online Encyclopedia of Life. Spea multiplicata (Cope, 1863): Integrated Taxonomic Information System (ITIS) Here you will find authoritative taxonomic information on plants, animals, fungi, and microbes of North America and the world. More symbols & emblems: Complete list of official New Mexico state symbols from NETSTATE.COM. Frog and Toad Posters and Prints : Frog and Toad Posters and prints from AllPosters.com. Care and Breeding of Popular Tree Frogs: A Practical Manual for the Serious Hobbyist: by Philippe de Vosjoli, Robert Mailloux, Drew Ready. Frogs, Toads, and Treefrogs: Everything About Selection, Care, Nutrition, Breeding, and Behavior: by R. D. Bartlett, Patricia P. Bartlett. Frogs and Toads : An Owner's Guide to a Happy Healthy Pet: by Steve Grenard. What is an Amphibian? (The Science of Living Things) , by Bobbie Kalman and Jacqueline Langille, 32 pages, Crabtree Publishing Company (2000). Reading level: Ages 9-12. The large, full-color photographs and illustrations that pepper every page of these books will catch the eye of browsers but it is the informative, easy-to-read texts that will hold their interest. Peterson First Guide to Reptiles and Amphibians , by Robert C. Stebbins, Joseph T. Collins and Roger Conant. Edited by Roger Tory Peterson. 128 pages, Houghton Mifflin Harcourt (April 15, 1999). From mudpuppies to rattlesnakes, this fascinating guide for young nature lovers describes the habits and habitats of these secretive and sometimes bizarre animals, and includes tips on how to catch and care for frogs, snakes, turtles, lizards, salamanders, and toads. A Field Guide to Reptiles & Amphibians of Eastern & Central North America , by Roger Conant and Joseph T. Collins, 640 pages, Houghton Mifflin Harcourt; Fourth Edition edition (May 15, 1998). This newly designed field guides features detailed descriptions of 595 species and subspecies. The 656 full-color illustrations and 384 drawings show key details for accurate identification. More than 100 color photographs and 333 color photographs and 333 color distribution maps accompany the species descriptions. Firefly Encyclopedia of Reptiles and Amphibians , edited by Tim Halliday and Kraig Adler, 240 pages, Firefly Books (September 7, 2002). With lush color photographs and lavishly detailed illustrations, this encyclopedia presents a striking abundance of information at a glance. Also noteworthy is the scholarly text, a comprehensive overview of these frequently studied phyla.